Las Vegas restaurant deals & dining coupons at great restaurants are easy to find, if you know where to look! It's not a secret that food in Vegas is pretty expensive. But I know how to save hundreds of dollars on restaurants and get a royal service, too. Below I've listed my favorite ways to get coupons for best restaurants in Las Vegas with up to 50% off! These restaurant deals are different, with their own advantages which I list right here - choose the program that suits you most! 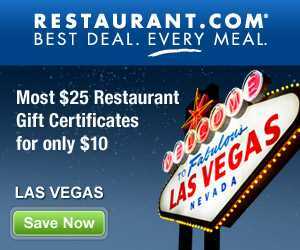 Restaurant.com is a great place for printable Las Vegas restaurant deals for the best restaurants in the city! Here is how it works. There are around 70 restaurants in Las Vegas that participate in this program. They offer various coupons, or gift certificates, on the amount from $10.00 to $100.00 that you can purchase with huge discounts. For example, a gift certificate worth $25 will cost you only $10 dollars, which will save you $15. Then you simply print this coupon, and take it to the restaurant of your choice when you are ready to dine there! You can print the coupons right away, or at any time you want. My favorite part about this program is that you can select among 70 restaurants, and read detailed reviews, and even a menu before you purchase your coupons! This way you are not limited to any special menu choice that is the case with some other Las Vegas restaurant coupons. 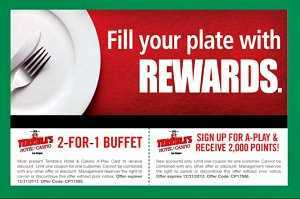 It's simply a smart way to dine, and great savings at any participating restaurant. When it comes to super saving, nothing beats the Entertainment Book! - it contains literally hundreds of Las Vegas restaurant deals! Even better, it contains 82 coupons for Las Vegas attractions, and 178 shopping discount coupons!. And all of this at a very low price - currently, it's sold at $28.00, which is $7 off it's regular price. Imagine, for only $28.00 you can save thousands of dollars in Vegas. Check out which restaurants, attractions and stores participate in the Entertainment Book. on the official websit. You can also find there a very useful map of all places where you can redeem your free Las Vegas restaurant deals on food. Even better, you can customize this map and select restaurants by cuisine, or view only attractions, or only shops. So finding restaurants with their maps is super easy. If you ever use an Entertainment Book at it's full potential, you would be able to save $58,515! There is also an option to download absolutely free printable Las Vegas restaurant deals. Unfortunately, the choice of restaurants in these free coupons is rather limited, but hey - what's free is free, right? If you don't find anything here, you can always come back to this page and check out the options we offer above and below! Finally, if you want to save in Vegas, you could sign up for deals at Groupon, if you haven't already. Not only do they frequently run deals and offer great Las Vegas restaurant deals, but you can also save on activities such as tours, shows, and attractions. On these 2 websites the saving are not mere 10-20% off, but usually 50% and more. So before you go on your vacation, always check if there is something you could use at half price off. Plus, both Groupon and Living Social might have some sweet deals in YOUR own city. 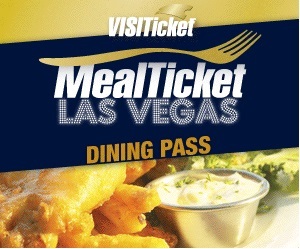 Las Vegas Meal Ticket allows you to save hundreds of dollars on dining at several great participating restaurants. Why is Meal Ticket among my top choices? Because you don't have to worry about redeeming your Las Vegas dining coupons. The Meal Ticket is priced per day, and comes in 3 versions: 1, 2, 3 or 5 consecutive days. The Las Vegas MealTicket dining pass packages breakfast, lunch and dinner at popular restaurants in Las Vegas into one affordable dining package. For this low price, you can have 3 meals per day - breakfast, lunch and dinner at 10 participating restaurants. The ticket comes with descriptions of the restaurants, menus, and directions - so you won't get lost! 5 out of 10 restaurants are located inside Miracle Miles at Planet Hollywood Resort and Casino: Fresh Grill and Bar; Cheeseburger, Lombardi’s Romagna Mia, La Salsa Cantina, Spice Market Buffet. You can pick up your Meal Ticket at Planet Hollywood Restaurant located at Forum Shops at Caesars Palace. Hours of Operation: Sunday-Thursday 11:00am-11:00pm. ; Friday-Saturday 11:00am-12:00am.